Whitewater Rafting On The Flathead River: Experience the thrill of the rapids (Class II-IV) as you soak in the majestic beauty that surrounds you. Canoeing At Moraine Lake: Glide in a canoe over the glittering waters of Moraine Lake or choose from a variety of other exciting outdoor activities in the beautiful setting of Banff National Park! Roam the Rockies on this Montana and Canada vacation that puts you in the heart of Big Sky Country along the Continental Divide. Explore glacial cliffs, gleaming lakes and churning rapids as you journey deep into this breath-taking area, teeming with nature's rugged beauty and majesty. Howdy! Upon landing at the Kalispell Airport your Adventure Guide will greet you and your family. Stretch your legs and relax as your luggage is taken care of. Since we are providing one group transfer based on the final group arrival time, early arrivers may spend some time at the airport. Then it's off to historic Glacier Park Lodge in our air-conditioned motor coach. Welcome to Big Sky Country! It's time to kick back as your Adventure Guide checks you into this rustic yet comfortable* lodge located just minutes from Glacier National Park. Savor an authentic Western outdoor BBQ among the towering peaks of the magnificent Rocky Mountains. Join the welcome reception as a local guitarist and singer serenades you into the tranquil Montana night. Experience the thrill of whitewater rafting as you ride the rapids on the Flathead River (Class II-IV) down the Middle Fork through John Stevens Canyon. For 8 miles (almost 13 km), your raft bobs and glides past the majestic peaks that rise to the sky on either side of you. Those seeking a more serene experience can float down the river's gentle North Fork to Blankenship Bridge for a scenic trip. Come ashore for a private picnic lunch of traditional BBQ fare, surrounded by the beauty of the Montana wilderness. Board this open-top vintage coach and climb up, up, up the Going-to-the-Sun Road as the stunning splendor of the Rockies unfolds before you. Gaze out over the incredible scenery as the vast canyons drop to dizzying depths below the roadside and glacial cliffs striped with snow tower over the verdant riverbanks. It's an unforgettable ride that will leave you breathless with wonder! Gather 'round to hear tales of old from a Native American storyteller in a private setting at the lodge. Learn the lore of how mankind has lived on the "Backbone of the World", where the mountains meet the sun. Dine at your leisure in The Great Northern Dining Room as you relay stories of the day's excitement in Big Sky Country. Following breakfast at the lodge, bid farewell to Glacier National Park. As you head north to Alberta, Canada, enjoy a scenic coach ride through the rolling hills of the Blackfoot Reservation and along the majestic Continental Divide. Perched on a bluff overlooking Waterton Lake, this charming chalet named after Edward III is where you'll enjoy a delicious meal before continuing to beautiful Lake Louise. Travel along Alberta's historic Cowboy Trail, which runs between the Rocky Mountains and the Canadian prairie. This is the real West up close! Then relax as your Adventure Guide checks you into The Fairmont Chateau Lake Louise, where scenic views of the mountains surround this elegant retreat. Relax and revel in the gorgeous lake views just beyond the windows of the hotel's charming main restaurant. 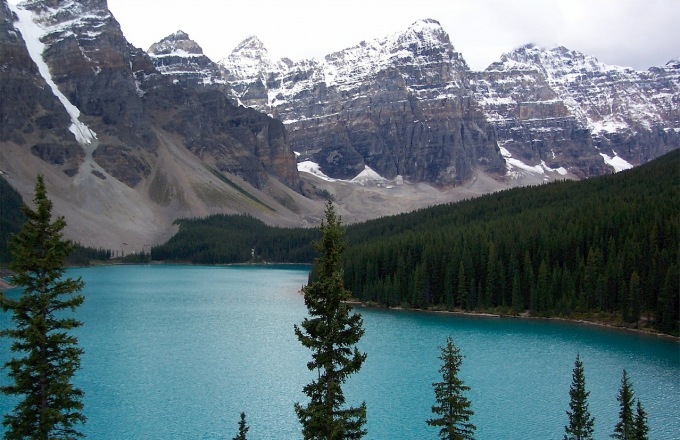 Take a short excursion to nearby Moraine Lake, a gleaming gem nestled in a stunning mountain range. Canoe across the tranquil turquoise surface of the lake - an experience you won't soon forget! Relax as the lake breezes cool you down during this scenic picnic lunch with your fellow Adventurers. Adults can enjoy a nice dinner at their leisure, while Junior Adventurers have an exclusive meal with the Adventure Guides. Parents can join the kids as the evening concludes with a special Disney movie presentation. Behold the greatest body of ice in North America! Board an ice exploration vehicle for a guided expedition that travels over the vast, tranquil Columbia Icefield, which straddles the North American Continental Divide. Discover the majesty of this incredible icefield that feeds 8 major glaciers beneath the peaks of towering mountains. Dine at a hearty buffet lunch with views of the Athabasca Glacier at this restaurant near the icefield. Travel by coach to the magnificent Fairmont Banff Springs, located just steps away from Banff. Styled after a Scottish baronial castle, this is your home away from home for the next two nights. Relax in the lobby as your Adventure Guides check you into the hotel. Find a bevy of dining options at your fingertips in Banff. Step out for a well-earned bite at a host of local eateries that cover the gamut from casual family fare to incredible French cuisine. Your Adventure Guides can help you with dinner recommendations. Wake up to a hearty Canadian breakfast at the hotel before you take a leisurely spin along the swirling waters of the Bow River. Park your bike for a short hike to view enchanting Bow Falls before spending some time exploring the colorful gardens at historic Canada House, a Banff landmark. Stroll through the delightful streets of laid-back Banff, where a variety of restaurants await you. Your Adventure Guides can help you with lunch recommendations. After lunch, a high-altitude adventure awaits in Banff National Park. Climb into your enclosed gondola for a ride up to the 7,500-foot (2286-meter) summit of Sulphur Mountain. The vast Rocky Mountain landscape can be seen for miles, including the view of 6 mountain ranges! Then relax in Banff's celebrated Upper Thermal Hot Springs as you soak in a swimming pool surrounded by fir forests and towering mountain peaks. As your mountain adventure comes to a ceremonious close, join your explorer friends for a farewell dinner in the heart of Banff. A fun surprise is in store when a special Canadian visitor makes an unforgettable appearance. After your final breakfast in Canada, bid your fellow travelers "happy trails" as you board pre-arranged transportation for a coach ride to Calgary airport.